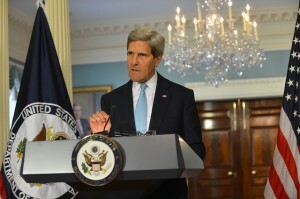 Kerry: US No Longer Seeking “Regime Change” in Syria? The declaration is not only bizarre, in that many of America’s “partners” in Syria are rebel factions formed explicitly to oust the government, but because Kerry himself, as well as other high-ranking US officials, have been openly demanding unconditional regime change for several years now. Kerry went into his Moscow visit saying Assad’s future would be a topic of discussion with Russian officials, which itself raised eyebrows since US officials have long insisted Assad has no future. Kerry doubled down on this, however, insisting that the US and Russia see Syria’s future fundamentally the same way. Russian officials have been much more forthcoming about their specific view of Syria’s future than the US previously has, offering proposals for a settlement between Assad and secular rebels leading to the drafting of a new constitution and free elections. The US had previously been seen objecting to that plan on the grounds that it didn’t rule out Assad and other key government officials participating in future elections, with Russia has long maintained they don’t want to dictate who is allowed to run.